These are small weekend suitcases at Dunelm Mill. Online and in store. 30% off normal prices. Possibly be used as carry on baggage?? 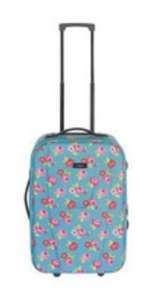 Dunelm also have reductions on other suitcases of all sizes making room for the new summer stock. If you are anywhere near the airport or are going to drop someone/ pick them up try it in the sizer as I have found the actual size bigger than that quoted.